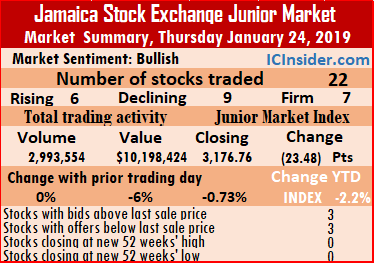 Trading on the Junior Market of the Jamaica Stock Exchange climbed sharply on Thursday with 8,679,414 units valued at $30,344,251 crossing the exchange, compared to 17,755,553 units valued at $89,888,819 exchanged on Wednesday. At the close of trading 29 securities changed hands, compared with 27 on Wednesday. The Junior Market index climbed 21.14 points to close at 3,091.22 as the prices of 12 securities rose, 9 declined and 8 remained unchanged. Trading ended with an average of 299,290 units for an average of $1,046,353 in contrast to 657,613 units for an average of $3,329,215 on Wednesday. The average volume and value for the month to date amounts to 206,420 shares valued at $875,602 compared to 194,026 shares valued at $852,887 on the previous day. In contrast, February closed with average of 235,225 units valued at $679,790 for each security traded. IC bid-offer Indicator| At the end of trading, the Investor’s Choice bid-offer indicator reading shows 8 stocks ended with bids higher than their last selling prices and 5 with lower offers. At the close of trading, Access Financial closed at $48, in trading 650 shares, AMG Packaging ended with a loss of 1 cent at $2, with 686,844 stock units changing hands, Blue Power concluded trading with 100 units after a loss of 35 cents to end at $4.65. Cargo Handlers settled with a loss of 7 cents at $12.58, with an exchange of 500 shares, Caribbean Flavours dropped $1.05 to close at $16.95 in trading 82,000 stock units, Caribbean Producers finished trading at $4.60, with 7,261 units changing hands. Derrimon Trading ended at $2.87, with an exchange of 30,950 shares, Everything Fresh finished 10 cents higher at $1.60, trading 7,000 stock units, Elite Diagnostic settled at $3.25, with 21,494 units trading. 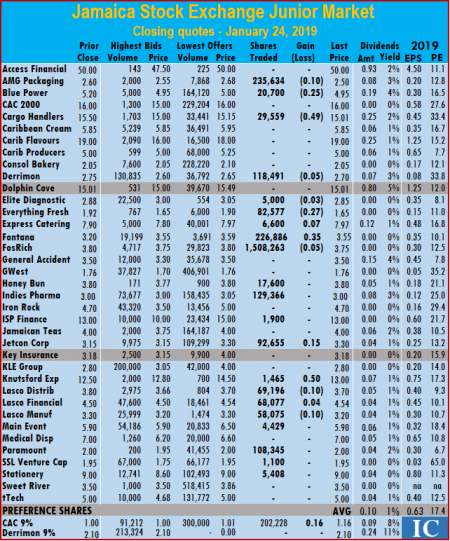 Express Catering ended trading 50 cents higher at $8, with 570,123 shares, FosRich Group traded with a loss of 16 cents at $4, with 75,479 shares, Fontana finished trading 130,851 shares at $4.06, General Accident closed 55 cents higher at $4.50, while exchanging 180,624 stock units. GWest Corporation gained 5 cents in closing at $1.80, trading 13,717 units, Honey Bun concluded trading of 12,800 shares at $3.85, ICreate gained 3 cents to close at 98 cents, in trading 42,305 shares, Indies Pharma finished with a loss of 10 cents at $3.01,with 475,330 shares changing hands. ISP Finance ended trading 500 stock units and rose $2 to close at $15.50, Jamaican Teas traded 72,300 units and rose 5 cents higher to $3.80, KLE Group ended at $2.80, with 8,689 shares changing hands, Knutsford Express concluded trading with 150 stock units and lost 10 cents to end at $12.70. Lasco Distributors finished 30 cents higher at $4, with an exchange of 10,150 units, Lasco Financial settled 1 cent higher at $4.41, with 10,400 shares trading, Lasco Manufacturing ended trading 6,167,975 shares after rising 6 cents to $3.06, Main Event traded 55 cents higher at $5.80, with 1,229 shares changing hands. Medical Disposables finished trading 43,371 stock units and rose 50 cents to $7.50, SSL Venture Capital ended at $1.70, with just 2,500 shares passing through the exchange, Stationery and Office concluded trading 23,924 shares with a loss of 22 cents in closing at $7.25 and Sweet River finished with a loss of 50 cents to close at a 52 weeks’ low of at $3, with 198 shares changing hands. FosRich traded at an all-time high of $4.50 on Friday. 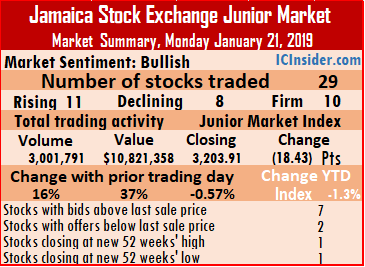 Trading on the Junior Market of the Jamaica Stock Exchange ended trading on Friday with more stocks declining than rising for a fourth day, leading to another fall in the market index of 19.66 points to close at 3,063.08. 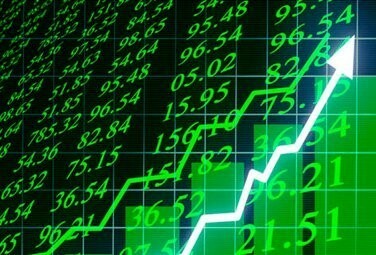 At the close of market activities, 31 securities changed hands, compared with 23 securities trading on Thursday and ending with the prices of 11 securities advanced, 11 declined and 9 remained unchanged.The market closed with 3,286,973 shares valued at $12,890,201 being exchanged compared to 2,723,771 units valued at $7,748,383 on Thursday. Trading ended with an average of 106,031 units for an average of $415,813 in contrast to 118,425 units for an average of $336,886 on Thursday. The average volume and value for the month to date amounts to 146,891 shares valued at $575,700 compared to 158,840 shares valued at $622,459 on the previous day. In contrast, February closed with average of 235,225 units valued at $679,790 for each security traded. IC bid-offer Indicator| At the end of trading, the Investor’s Choice bid-offer indicator reading shows 5 stocks ended with bids higher than their last selling prices and 5 with lower offers. At the close of trading, AMG Packaging ended 9 cents higher at $2.29, with 128,175 stock units changing hands, Cargo Handlers ended $12.65 higher at $12.65, with 5,500 stock units, Caribbean Cream settled at $5.25, with an exchange of 9,438 shares, Caribbean Producers traded 97,982 stock units at $4.47, Consolidated Bakeries finished trading 3,650 units, 1 cent higher to $2. Derrimon Trading closed with a loss of 11 cents at $2.80, with 25,009 shares changing hands, Dolphin Cove ended with a loss of $1.90 to $11.60, trading 176,147 shares, Everything Fresh concluded trading of 158,747 shares for 10 cents higher at $1.65, Elite Diagnostic finished with a loss of 10 cents at $3.20, with 10,000 stock units changing hands. Express Catering settled 42 cents higher at $8.30, with an exchange of 114,037 units, FosRich Group ended trading 33,093 shares at $4,after trading at an intraday all-time high of $4.50. 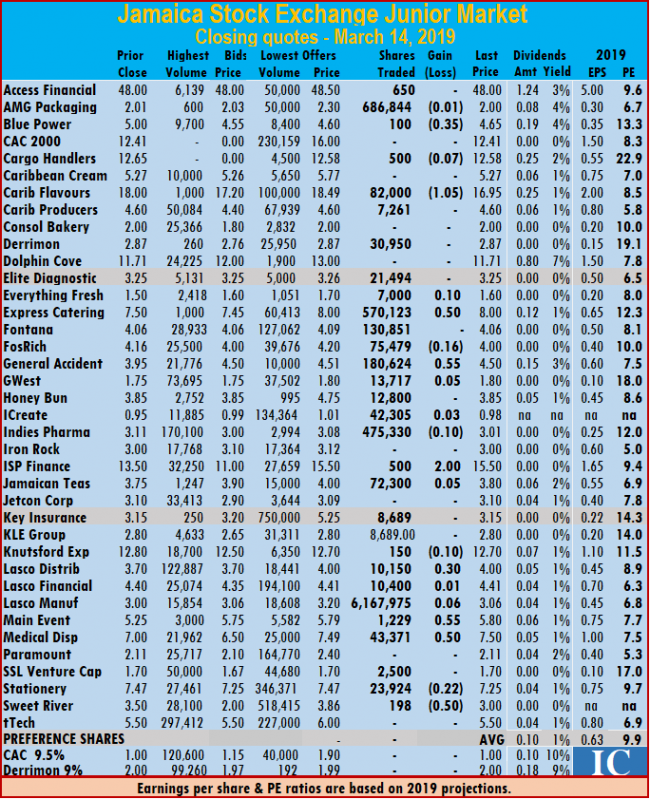 Fontana traded 622,444 shares to close at $4, General Accident exchanged 73,369 shares with a gain of 5 cents to $4.35, GWest Corporation closed at $1.75, with 6,342 stock units changing hands, Honey Bun ended at $3.70, trading 705,845 units, ICreate fell 2 cents to close at 93 cents, trading 409,781 shares. 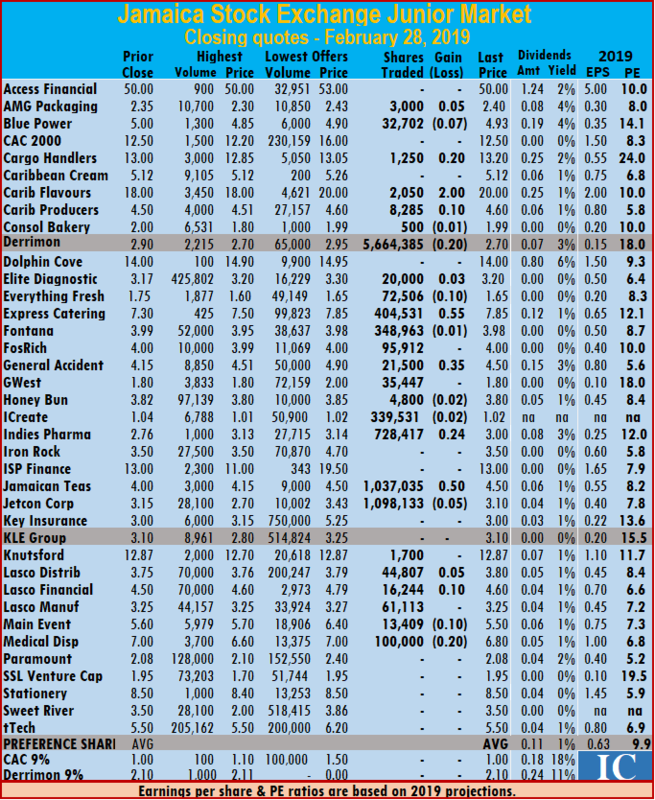 Indies Pharma concluded trading of 42,204 shares with a loss of 25 cents at $2.75, Iron Rock finished with a loss of 50 cents at $3, with an exchange of 127,000 shares, ISP Finance rose 50 cents higher to $13.50, with 19,934 shares changing hands. 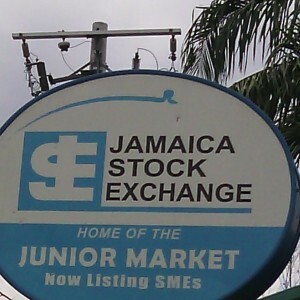 Jamaican Teas ended trading 79,420 stock units, with a loss of 5 cents at $3.80, Jetcon Corporation swapped 11,594 units, with a loss of 23 cents at $2.72, Key Insurance finished trading 5,000 shares and rose 15 cents higher to $3.15, Knutsford Express ended at $12, with 200 shares changing hands. Lasco Distributors lost 5 cents to end at $3.70, with an exchange of 193,061 stock units, Lasco Financial finished 8 cents higher at $4.59, trading 14,764 units, Lasco Manufacturing gained 4 cents to end at $3.05, with 48,900 shares changing hands, Main Event ended trading of 59,700 shares and gained 44 cents to close at $5. Medical Disposables traded 6,500 shares after rising 20 cents higher to $7, Stationery and Office dropped $1.20 to $7, with 39,298 shares changing hands and SSL Venture Capital closed at $1.70, with 28,115 units. 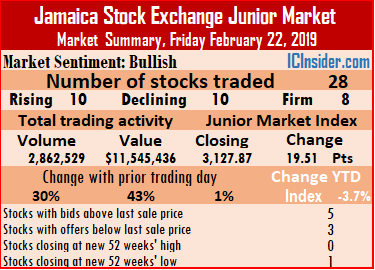 In the junior market preference segment, Derrimon Trading 9% preference share concluded trading of 31,724 units at $2.10. Derrimon Trading exchanged 5.66m shares. 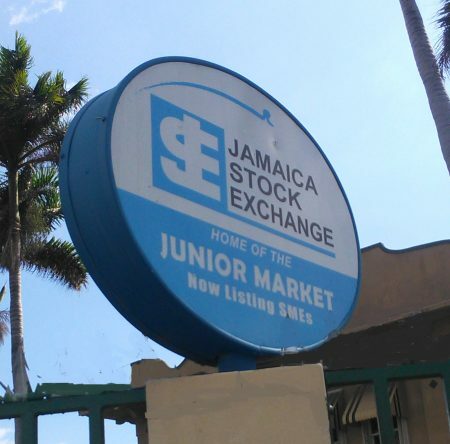 Derrimon dominated trading on the Junior Market of the Jamaica Stock Exchange on Thursday with 5.66 million shares changing hands accounting for nearly 56 percent of the Junior Market volume traded. At the close of market activities advancing stocks edged out declining ones with the Index inching 0.15 points higher to close at 3,127.66 as the prices of 11 securities rose, 10 declined and 4 remained unchanged. Trading ended on Thursday with 25 securities changing hands, resulting in an exchange of 10,156,220 units valued at $31,853,419 compared to 3,473,115 units valued at $10,367,273 on Wednesday from 28 securities changing hands. Trading closed with an average of 406,249 units for an average of $1,274,137 in contrast to 124,040 units for an average of $370,260 on Wednesday. The average volume and value for the month to date, amounts to 235,225 units valued at $679,790 and previously, 226,842 units valued at $650,656 in contrast to 204,171 units for an average of $803,427. In contrast, January closed with average of 2,245,428 units with a value of $7,372,574 for each security traded. IC bid-offer Indicator| At the end of trading, the Investor’s Choice bid-offer indicator reading shows 8 stocks ended with bids higher than their last selling prices and 3 with lower offers. 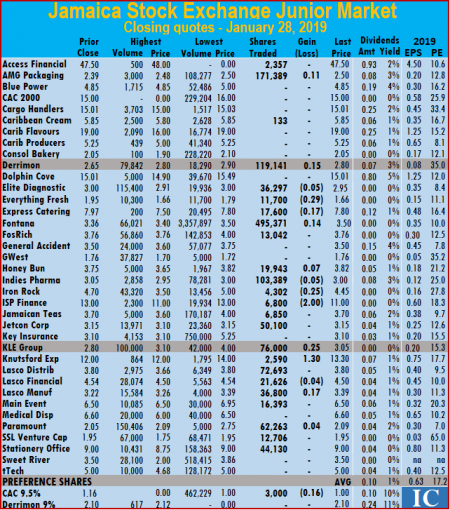 At the close of the trading, AMG Packaging ended 5 cents higher at $2.40, while trading 3,000 shares, Blue Power concluded trading of 32,702 units, with a loss of 7 cents to close at $4.93, Cargo Handlers gained 20 cents to close at $13.20, with 1,250 shares crossing over the trading platform. Caribbean Flavours traded 2,050 stock units and climbed $2 to $20, Caribbean Producers finished trading 10 cents higher at $4.60, with an exchange of 8,285 units. Consolidated Bakeries closed with a loss of 1 cent at $1.99, with 500 shares changing hands, Derrimon Trading ended with a loss of 20 cents at $2.70, with an exchange of 5,664,385 shares, Everything Fresh finished with a loss of 10 cents at $1.65, trading 72,506 stock units. Elite Diagnostic settled 3 cents higher at $3.20, with 20,000 units changing hands, Express Catering ended trading 404,531 shares after rising 55 cents higher at $7.85, FosRich Group traded 95,912 shares at $4, Fontana finished trading 348,963 shares with a loss of 1 cent at $3.98, General Accident closed 35 cents higher at $4.50, with 21,500 stock units changing hands. GWest Corporation ended at $1.80, with 35,447 units traded, Honey Bun concluded trading of 4,800 shares with a loss of 2 cents at $3.80, ICreate traded 399,531 shares with a lost of 2 cents to close at $1.02. Indies Pharma finished 24 cents higher at $3, with 728,417 shares changing hands, Jamaican Teas traded 1,037,035 units and rose 50 cents higher to close at $4.50. Jetcon Corporation finished trading 1,098,133 shares, with a loss of 5 cents at $3.10, Knutsford Express concluded trading of 1,700 stock units at $12.87, Lasco Distributors finished 5 cents higher at $3.80, with 44,807 units changing hands, Lasco Financial settled 10 cents higher at $4.60, in trading 16,244 shares. Lasco Manufacturing ended trading of 61,113 shares at $3.25, Main Event traded 13,409 shares with a loss of 10 cents to close at $5.50 and Medical Disposables finished trading 100,000 stock units with a loss of 20 cents at $6.80. 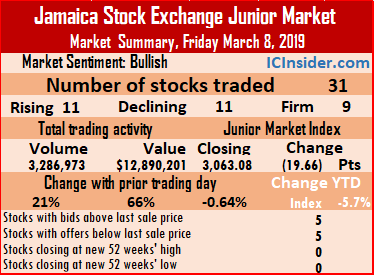 Trading on the Junior Market of the Jamaica Stock Exchange ended with on Friday with the Index rising 19.51 points to 3,127.87 as the prices of 10 securities rose, 10 fell and 8 remained unchanged. Trading resulted in an exchange of 2,862,529 units valued at $11,545,436 with 28 securities changing hands, compared to 2,207,101 units valued at $8,095,275 on Thursday from 26 securities. Main Event closed at a 52 weeks’ low of $5. Trading ended with an average of 102,233 units for an average of $412,337 in contrast to 84,889 units for an average of $311,357 on Thursday. The average volume and value for the month to date amounts to units 241,136 valued at $658,769 and previously 251,058 valued at $676,371. In contrast, January closed with average of 2,245,428 units with a value of $7,372,574 for each security traded. IC bid-offer Indicator| At the end of trading, the Investor’s Choice bid-offer indicator reading shows 5 stocks ended with bids higher than their last selling prices and 3 with lower offers. 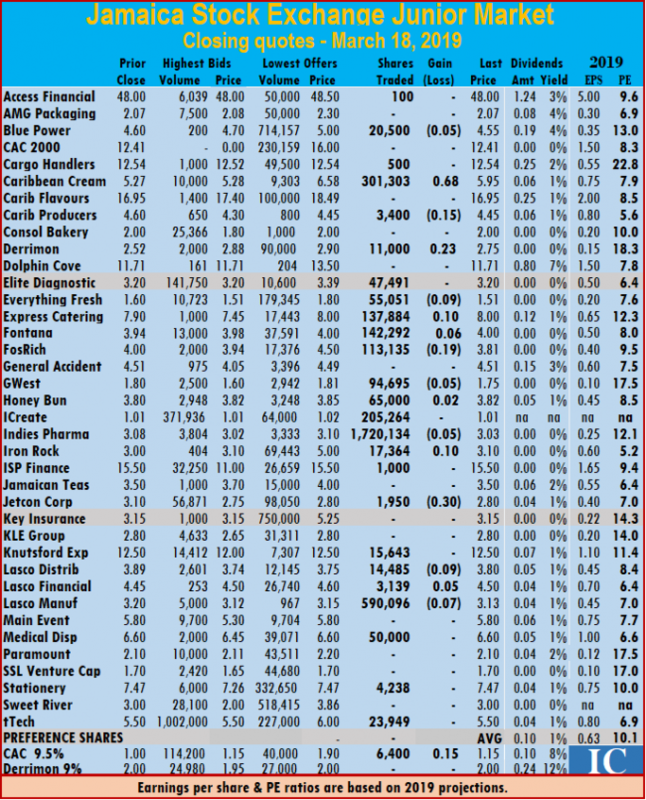 At the close of the trading, AMG Packaging ended 4 cents higher at $2.49, trading 43,526 stock units, Blue Power concluded trading of 31,589 units, with a loss of 6 cents at $4.94, Cargo Handlers settled at $14, with 5,850 shares changing hands, Caribbean Producers finished trading 164,694 units, with a loss of 20 cents at $4.50. Consolidated Bakeries closed at $1.80, with an exchange of 10,350 shares. Derrimon Trading ended 15 cents higher at $2.95, in exchanging 390,716 shares, Dolphin Cove concluded trading of 1,973 shares with a loss of 1 cent at $14, Everything Fresh ended 4 cents higher at $1.74, with 4,500 stock units, Elite Diagnostic settled with a loss of 25 cents at $3.15, trading 10,984 units. Express Catering ended trading 241,022 shares, with a loss of 1 cent to close at $7.49, FosRich Group traded 48,639 shares at $4, Fontana finished trading 9 cents higher at $3.95, with 337,361 shares crossing the exchange platform, General Accident closed at $4, with 39,838 stock units changing hands. GWest Corporation ended 5 cents higher at $1.75, with an exchange of 97,288 units, Honey Bun concluded trading of 600 shares, with a loss of 1 cent to end at $3.98, Indies Pharma finished with a loss of 8 cents at $2.91, trading 19,777 shares, Iron Rock settled 5 cents higher at $3.55, in exchanging 29,885 shares. 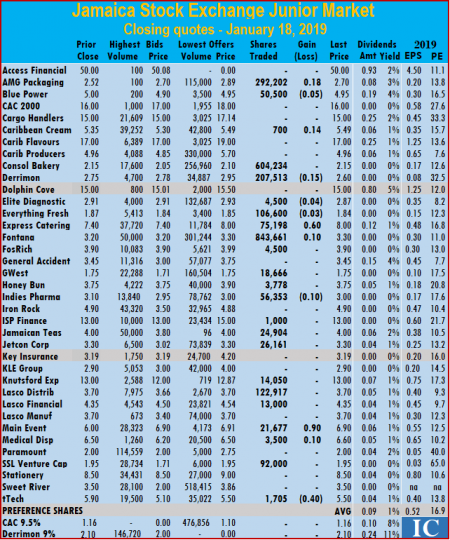 ISP Finance ended trading 15,000 stock units, at $13, Jamaican Teas traded 10,000 units, with a loss of 5 cents to close at $3.95, Jetcon Corporation finished trading 6,200 shares and rose 39 cents to end at $3, Knutsford Express concluded trading of just 100 stock units at $13. Lasco Distributors exchanged 865,988 units, at $3.75, Lasco Financial settled 1 cent higher at $4.80, with an exchange of 85,000 shares, Lasco Manufacturing ended trading 323,827 shares at $3.27, Main Event traded with 1,000 shares with a loss of 70 cents to close at a 52 weeks’ low of $5. 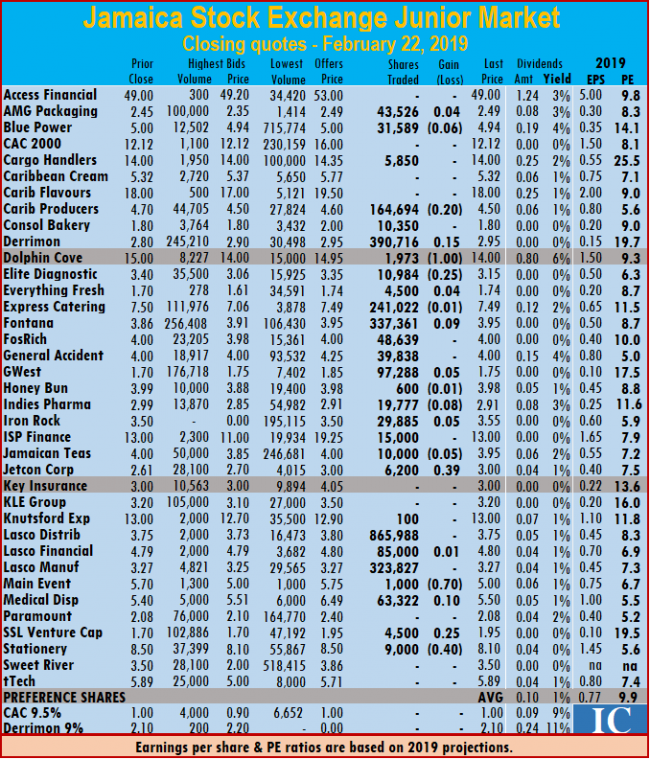 Medical Disposables gained 10 cents to $5.50, with 63,322 stock units changing hands, SSL Venture Capital ended 25 cents higher at $1.95, trading 4,500 shares and Stationery and Office concluded trading with 9,000 shares with a loss of 40 cents to close at $8.10. 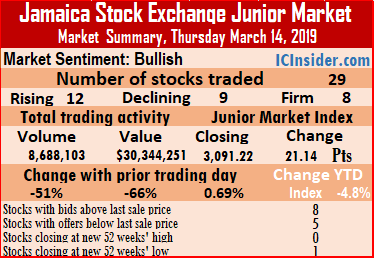 Junior market trading ended with the Index gaining 27.35 points to close at 3,101.31 on Wednesday with the prices of 13 securities advancing, 9 declining and 5 remaining unchanged. Trading ended with 27 securities changing hands, compared to 26 previously, resulting in an exchange of 2,637,177 units valued at $9,847,525, compared to 3,139,829 units valued at $14,134,481 on Tuesday. Trading ended with an average of 97,673 units for an average of $364,723 in contrast to 120,763 units for an average of $543,634 on Tuesday. The average volume and value for the month to date amounts to units 270,714 valued at $702,301 and previously 276,019 valued at $729,188. In contrast, January closed with average of 2,245,428 units with a value of $7,372,574 for each security traded. At the close of the market, AMG Packaging ended at $2.50, with an exchange of 2,420 stock units, Blue Power traded 6,315 units and rose 15 cents to close at $5, CAC 2000 finished with a loss of 48 cents at $12.12, with 500 shares changing hands. Cargo Handlers settled with a loss of 50 cents at $14, in exchanging 500 shares, Caribbean Flavours traded 500 stock units with a gain of $1.42 to close at $18, Caribbean Producers finished trading 19,809 units at $4.70, Derrimon Trading ended at $2.70, with an exchange of 155,256 shares. Dolphin Cove concluded trading of 700 shares at $15, with a loss of 50 cents. Everything Fresh finished with a loss of 19 cents at $1.60, trading 57,525 stock units, Elite Diagnostic settled at $3, with an exchange of 4,100 units, Express Catering ended trading of 62,902 shares, at $7.06. FosRich Group traded 204,252 shares, with a loss of 7 cents to close at $3.98, Fontana finished trading with a loss of 4 cents at $3.95, with 816,855 shares changing hands. General Accident closed 1 cent higher at $4, while exchanging 82,475 stock units, GWest Corporation ended 14 cents higher at $1.69, with 15,182 units trading, Honey Bun concluded trading of 201,036 shares and rose 14 cents higher to $3.99, Indies Pharma finished 10 cents higher at $2.80, in exchanging 61,592 shares. ISP Finance ended trading with 5,000 stock units and climbed $2 to $13, Jamaican Teas traded 81,678 units for 28 cents more at $4, Jetcon Corporation finished trading 446,571 shares, adding 15 cents to end at $3.15, Knutsford Express lost $1.60 cents to close at $10.90, with 4,100 stock units changing hands. Lasco Distributors finished with a loss of 29 cents at $3.70, with 210,378 units trading, Lasco Financial settled 24 cents higher at $4.80, with 82,082 shares crossing through the exchange, Lasco Manufacturing ended trading with 101,576 shares, and rose 4 cents to end at $3.20, Medical Disposables finished trading 1,381 stock units and gained 25 cents to end at $5.75. SSL Venture Capital ended with a loss of 5 cents at $1.90, trading 9,803 shares and Stationery and Office concluded trading 30 cents higher at $8.50, with 2,689 shares changing hands. 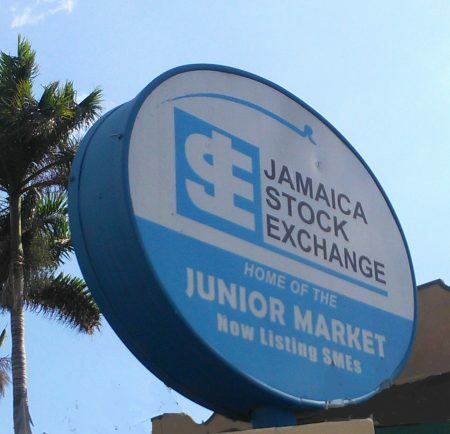 Trading on the Junior Market of the Jamaica Stock Exchange ended with 25 securities changing hands on Monday compared with 26 securities changing hands on Friday as the market see\ms to be in a consolidating mood. Trading ended on Monday with the prices of 8 securities advancing, 8 declining and 9 remaining unchanged leading the Junior Market index to slip by6.66 points to close at 3,165.71. Market activities resulted in an exchange of 1,406,615 shares with a value of $5,000,809 compared to 1,993,202 units carrying a value of $6,873,532 trading on Friday. Trading ended with an average of 56,265 units for an average of $200,032 in contrast to 76,662 units for an average of $264,367 on Friday. The average volume and value for the month to date amounts to 2,584,919 units valued at $8,127,677 and previously 2,732,277 units valued at $8,589,661, In contrast, December ended with an average of 136,222 units at a value of $737,367 for each security traded. IC bid-offer Indicator| At the end of trading, the Investor’s Choice bid-offer indicator reading shows 4 stocks ended with higher bids than their last selling prices and 2 closing with lower offers. At the close of the day’s activities, Access Financial closed at $47.50, in trading 2,357 shares, AMG Packaging rose 11 cents to $2.50, with 171,389 stock units changing hands, Caribbean Cream ended trading just 133 shares at $5.85. Derrimon Trading ended 15 cents higher at $2.80, with an exchange of 119,141 shares, Elite Diagnostic finished with a loss of 5 cents at $2.95, trading 36,297 stock units. Everything Fresh declined by 29 cents in trading of 11,700 shares to close at $1.66, Express Catering settled with a loss of 17 cents at $7.80, with an exchange of 17,600 units, Fontana gained 14 cents to close at $3.50 with 495,371 shares changing hands. 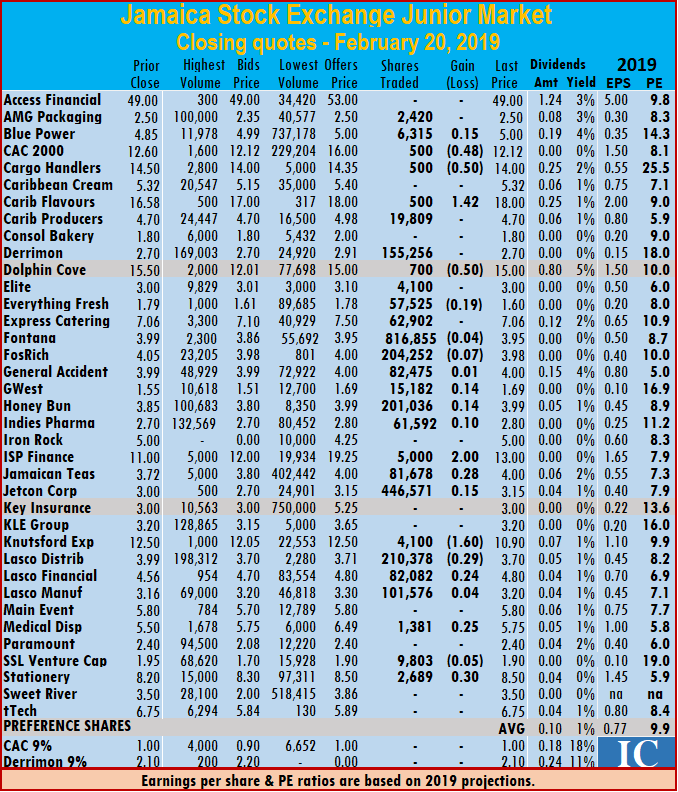 FosRich Group ended trading 13,042 shares at $3.76, Honey Bun closed 7 cents higher at $3.82, with an exchange of 19,943 stock units, Indies Pharma lost 5 cents in ending at $3, with 103,389 units changing hands, Iron Rock ended with a loss of 25 cents at $4.45, with 4,302 units trading. 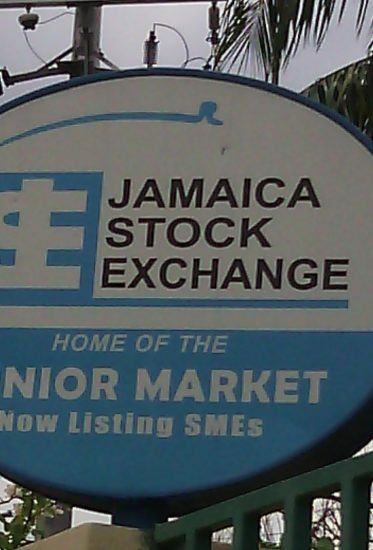 ISP Finance concluded trading with a loss of $2 to $11, with 6,800 shares changing hands, Jamaican Teas closed at $3.70, trading 6,850 shares, Jetcon Corporation settled at $3.15, with an exchange of 50,100 shares, KLE Group traded 76,000 units and rose 25 cents higher to $3.05, Knutsford Express finished trading of 2,590 shares, and jumped $1.30 to $13.30. Lasco Distributors closed at $3.80, trading 72,693 shares, Lasco Financial ended with a loss of 4 cents at $4.50, with 21,626 shares changing hands, Lasco Manufacturing concluded trading 17 cents higher at $3.39, with 36,800 stock units. Main Event finished at $6.50, exchanging 16,393 units, Paramount Trading ended 4 cents higher at $2.09, trading 62,263 shares, SSL Venture Capital exchanged 22,706 shares to close at $1.95 and Stationery and Office traded 44,130 shares at $9,. In the junior market preference segment, CAC 2000 lost 16 cents and closed at $1, with 3,000 shares changing hands. 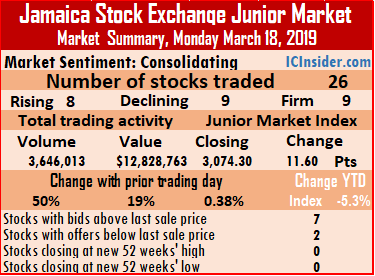 Trading on the Junior Market of the Jamaica Stock Exchange ended on Thursday with 22 securities changing hands, down from 26 on Wednesday with 6 securities advancing, 9 declining and 7 remaining unchanged leaving the index 23.48 points lower at 3,176.76. Market activities resulted in an exchange of 2,993,554 units valued at $10,198,424 compared to 935,202,554 shares trading for $2,856,946,636 on Wednesday. Trading ended with an average of 136,071 units for an average of $463,565 in contrast to 38,966,773 units for an average of $119,039,443 on Wednesday. The average volume and value for the month to date amounts to units 2,903,607 valued at $9,126,777 and previously 2,980,227 units valued at $9,627,015, In contrast, December ended with an average of 136,222 units at a value of $737,367 for each security traded. IC bid-offer Indicator| At the end of trading, the Investor’s Choice bid-offer indicator reading shows 3 stocks ended with higher bids than their last selling prices and 3 closing with lower offers. At the close of the day’s activities, AMG Packaging ended with a loss of 10 cents in trading 235,634 stock units, to close at $2.50, Blue Power concluded trading of 20,700 units and fell of 25 cents to end at $4.95, Cargo Handlers settled with a loss of 49 cents at $15.01, with 29,559 shares. Derrimon Trading ended with a loss of 5 cents at $2.70, with an exchange of 118,491 shares, Elite Diagnostic finished with a loss of 3 cents at $2.85, trading 5,000 stock units, Everything Fresh lost 27 cents and closed trading of 82,577 shares at $1.67, Express Catering settled 7 cents higher at $7.97, with 6,600 units. Fontana rose 35 cents to close at $3.55 with 226,886 shares changing hands, FosRich Group ended trading of 1,508,263 shares with a loss of 5 cents to close at $3.75, Honey Bun closed at $3.80, with 17,600 stock units changing hands, Indies Pharma ended with 129,366 units changing hands at $3, ISP Finance concluded trading of 1,900 shares at $13. Jetcon Corporation settled 15 cents higher at $3.30, with 92,655 shares trading, Knutsford Express finished trading of 1,465 shares and rose 50 cents higher to $13, Lasco Distributors closed with a loss of 10 cents at $3.70, trading 69,196 shares, Lasco Financial ended 4 cents higher at $4.54, with an exchange of 68,077 shares. Lasco Manufacturing ended trading with 58,075 stock units, with a loss of 10 cents at $3.20, Main Event finished at $5.90, with 4,429 units, Paramount Trading closed at $2, with 108,345 shares trading, SSL Venture Capital exchanged 1,100 shares to close at $1.95 and Stationery and Office traded 5,408 shares at $9. In the junior market preference segment, CAC 2000 gained 16 cents and closed at $1.16, with 202,228 shares changing hands. 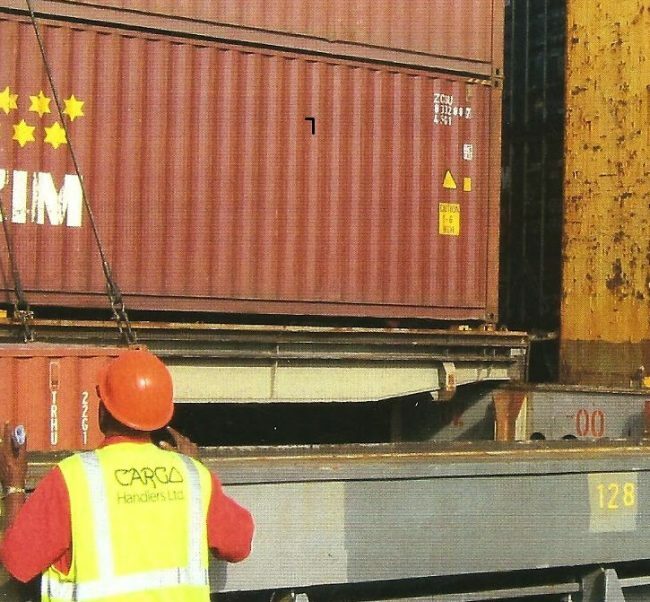 Cargo Handlers hits 52 weeks’ high. 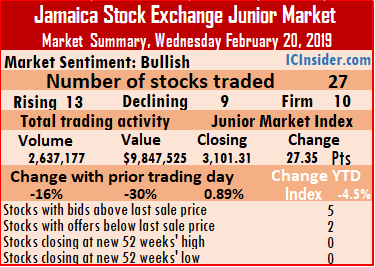 Trading on the Junior Market of the Jamaica Stock Exchange ended on Monday with 29 securities changing hands, with the prices of 11 securities advanced, 8 declined and 10 remained unchanged and the Junior Market Index falling 18.43 points to 3,203.91. Trading resulted in an exchange of 3,001,791 units valued at $10,821,358 compared to 2,589,319 units valued at $7,927,611 on Friday, from 23 securities changing hands. Trading ended with an average of 103,510 units for an average of $373,150 in contrast to 112,579 units for an average of $344,679 on Friday. The average volume and value for the month to date amounts to 578,429 units valued at $2,341,491, previously 617,911 units valued at $2,530,504. In contrast, December ended with an average of 136,222 units at a value of $737,367 for each security traded. IC bid-offer Indicator| At the end of trading, the Investor’s Choice bid-offer indicator reading shows 7 stocks ended with higher bids than their last selling prices and just 2 closing with lower offers. At the close of the day’s activities, Access Financial closed with a loss of $1 at $49, in trading of 2,286 shares, AMG Packaging ended 10 cents higher at $2.80, with an exchange of 546,887 stock units, Blue Power concluded trading of 23,948 units at $4.95, Cargo Handlers settled 50 cents higher at a 52 weeks’ high of $15.50, with 1,000 shares changing hands. Caribbean Cream ended trading with 181,879 shares, rising 36 cents higher to $5.85, Caribbean Flavours traded 10,200 stock units, and gained $2 to close at $19, Caribbean Producers finished trading 38,890 units, for 1 cent higher at $4.97, Consolidated Bakeries closed with a loss of 5 cents at $2.10, in exchanging 28,740 shares. 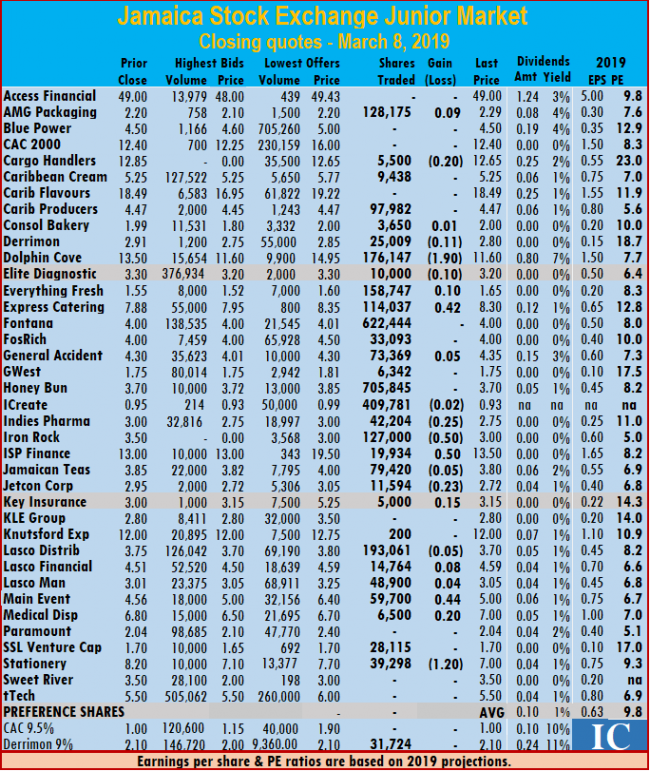 Derrimon Trading ended 35 cents higher at $2.95, with 18,012 shares changing hands, Elite Diagnostic finished 18 cents higher at $3.05, with 382,687 stock units trading, Everything Fresh rose 8 cents in trading 104,348 shares at $1.92, Express Catering settled at $8, with 129,312 units changing hands, Fontana lost 10 cents in trading 1,105,394 shares and closed at $3.20. 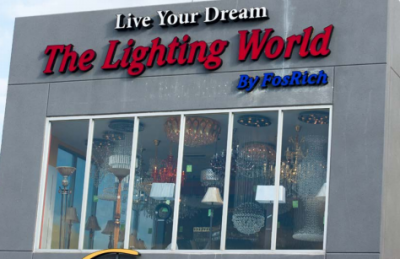 FosRich Group ended trading 11,067 shares, for 10 cents higher at $4, GWest Corporation finished trading at $1.75, with an exchange of 4,931 shares. Honey Bun closed at $3.75, with 1,812 stock units trading, Indies Pharma fell 5 cents to end at $2.95, trading 85,832 shares, ISP Finance concluded trading of 6,995 shares at $13, KLE Group traded 1,039 units with a loss of 10 cents to end at $2.80, Knutsford Express traded 12,868 shares at $13. 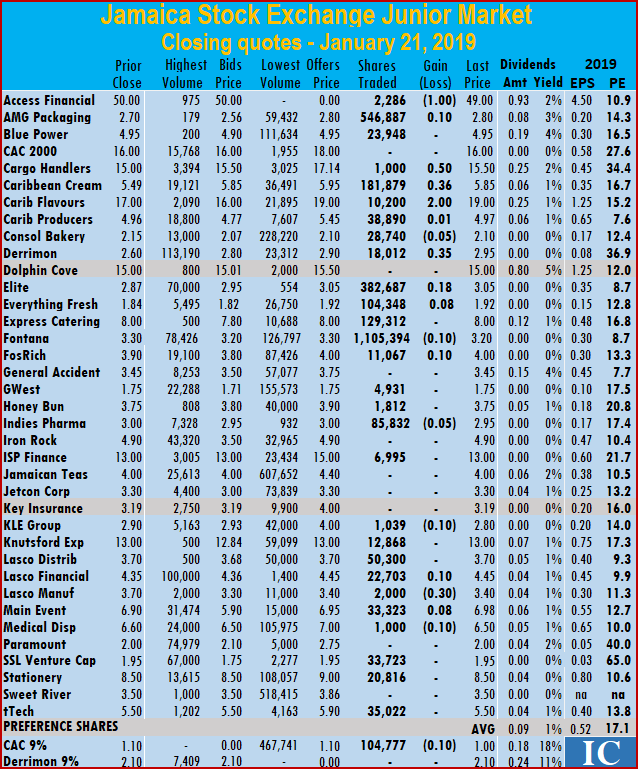 Lasco Distributors closed at $3.70, in trading 50,300 shares, Lasco Financial ended 10 cents higher at $4.45, in swapping 22,703 shares, Lasco Manufacturing concluded trading of 2,000 stock units, with a loss of 30 cents at $3.40, Main Event finished 8 cents higher at $6.98, with 33,323 units changing hands. Medical Disposables settled with a loss of 10 cents at $6.50, after 1,000 shares were exchanged, SSL Venture Capital exchanged 33,723 shares to close at $1.95, Stationery and Office traded 20,816 shares at $8.50 and tTech closed at $5.50, trading 35,022 units. 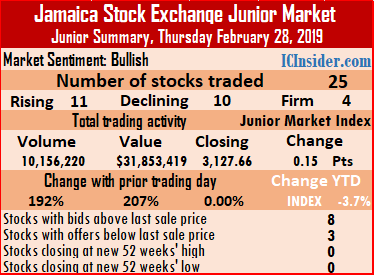 In the junior market preference segment, CAC 2000 closed with a loss of 10 cents to close at a 52 weeks’ low of at $1, with 104,777 shares traded. 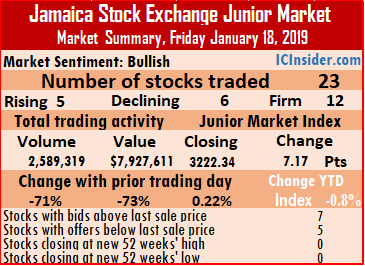 Trading on the Junior Market of the Jamaica Stock Exchange on Friday resulted in an exchange of 2,589,319 units valued at $7,927,611, down from 8,871,009 units valued at $29,431,464 on Thursday. Market activity closed with just 23 securities changing hands, down from 30 securities trading on Thursday. 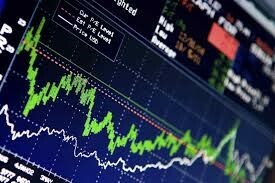 At the close, the prices of 5 stocks rose, 6 fell and 12 remained unchanged. 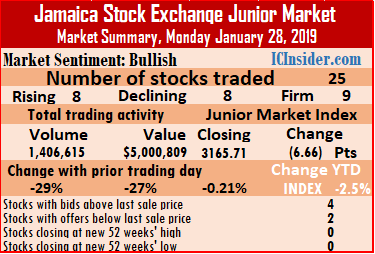 Trading activity moved the Junior Market Index up 7.17 points to 3,222.34. Trading ended with an average of 112,579 units for an average of $344,679 in contrast to 295,700 units for an average of $981,049 on Thursday. The average volume and value for the month to date amounts to 617,911 units valued at $2,530,504, previously 659,569 units valued at $2,710,697. In contrast, December ended with an average of 136,222 units at a value of $737,367 for each security traded. At the close of the day’s activities, AMG Packaging ended 18 cents higher at $2.70, with 292,202 stock units trading, Blue Power concluded trading of 50,500 units with a loss of 5 cents at $4.95, Caribbean Cream ended trading 14 cents higher at $5.49, with an exchange of 700 shares. Consolidated Bakeries closed at $2.15, with 604,234 shares trading, Derrimon Trading ended with a loss of 15 cents at $2.60, exchanging 207,513 shares. Elite Diagnostic finished with a loss of 4 cents at $2.87, trading 4,500 stocks, Everything Fresh lost 3 cents to end trading of 106,600 shares at $1.84. Express Catering jumped 60 cents to $8, with 75,198 units changing hands, Fontana gained 10 cents in trading 843,661 shares and closed at $3.30, but the stock closed with more selling than buying, FosRich Group ended trading of 4,500 shares at $3.90. GWest Corporation traded 18,666 shares at $1.75, Honey Bun concluded trading of 3,778 units at $3.75, Indies Pharma fell 10 cents to end at $3, trading 56,353 shares, ISP Finance ended at $13, with just 1,000 units trading, Jamaican Teas concluded trading with 24,904 shares at $4, Jetcon Corporation finished at $3.30, with 26,161 shares trading. Knutsford Express traded 14,050 units at $13, Lasco Distributors finished trading 122,917 shares at $3.70, Lasco Financial closed at $4.35, trading 13,000 shares. Main Event concluded trading with 21,677 stock units, and gained 90 cents to close at $6.90, Medical Disposables finished 10 cents higher at $6.60, with 3,500 units changing hands, SSL Venture Capital exchanged 92,000 shares to close at $1.95 and tTech finished trading of just 1,705 stock units with a loss of 40 cents at $5.50.